Four species of Asian carps, bighead carp, silver carp, black carp, and grass carp, are threats to Great Lakes fisheries. 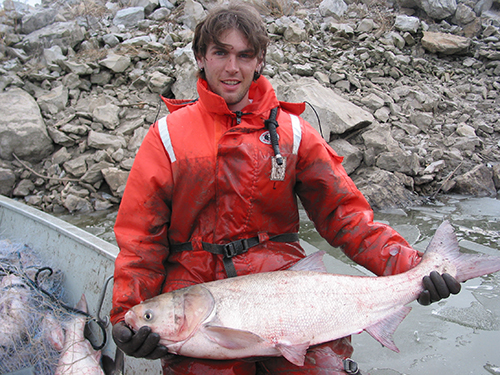 Recent peer-reviewed risk assessments for bighead carp and silver carp, and grass carp indicate that the Great Lakes are at substantial risk from these three species. The primary threat from Asian carps is competition with other fish for food resources, and the likely ability of these invaders to outcompete native desirable fishes. The risk from black carp has yet to be evaluated. As with other invaders, the Great Lakes Fishery Commission believes that preventing the introduction and establishment of Asian carps is the only effective approach to sustaining the valuable Great Lakes fishery. All four Asian carps grow to large sizes approaching or exceeding 100 lbs and four feet in length. Bighead carp and silver carp feed on small plants and animals floating in the water, called plankton. Grass carp feed on rooted plants in shallow water areas. Black carp feed primarily on snails and mollusks. All four Asian carps were imported to North America to assist with pest control in aquaculture facilities, and have since escaped into the wild. Grass carp also are sold in parts of the United States to help control aquatic vegetation in lakes and ponds. Most grass carp sold in the U.S. are considered to be sterile, thanks to a certification program run by the U. S. Fish and Wildlife Service. Since escaping into the wild, the Asian carps have moved northward through the Mississippi River basin toward Lake Michigan. Bighead and silver carps are now within 47 miles of Lake Michigan. Black carp are still nearly 300 miles from Lake Michigan. Because of the threat these invasive carps hold for the Great Lakes, the commission is actively working with partner agencies to prevent their introduction and establishment. The commission partnered with Fisheries and Oceans Canada, U.S. Fish and Wildlife Service, and U.S. Geological Survey to author the two completed risk assessments. The commission is a member of the Asian Carp Regional Control Committee (ACRCC), with staff serving on the Communications Workgroup and as a co-chair of the Monitoring and Response Work Group (MRWG). 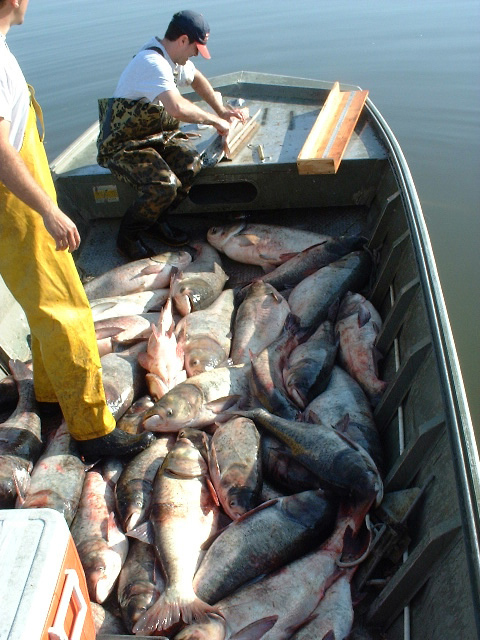 The ACRCC develops an Action Plan for Asian carp control each year. The MRWG is the action arm of the ACRCC, working to monitor the Upper Illinois Waterway (IWW) and the Chicago Area Waterway System, to manage Asian carp populations in the upper IWW, and to respond to any changes in the status of Asian carps in the upper IWW. The MRWG takes an adaptive approach to annual response plans. Great Lakes fishery management agencies adopted a position statement in 2012, focusing on preventing the establishment of these invaders, and recently established an Invasive Fishes Committee to facilitate coordination, communication, and advice about fishery management priorities for Asian carps within the basin, and between the Great Lakes and other affected river basins in the U.S.
For more information about Asian carps, visit asiancarp.us.